ENLISTED QUALIFICATIONS HISTORY The Enlisted Qualifications History, NAVPERS 1070/604, is page 4 of the service record. The initial page 4 is prepared by the classification section at the Military Entrance Processing Station (MEPS). This form is a permanent part of your enlisted service record and accompanies you throughout your active-duty or inactive-duty career. Subsequent page 4s are prepared by your command after a section becomes filled with entries. The page 4 has a wealth of information that is of considerable value to you and the Navy. It includes but is not limited to the following: 1. Education experience level (highest grade completed, General Education Development [GED]). See figure 4-6, section 1. 2. Classification/Armed Services Vocational Aptitude Battery (ASVAB) testing qualifications. (This section is to be completed by enlisted classifiers only.) See figure 4-6, section 2. 3. Off-duty education/non-required Navy correspondence courses (Scholastic Aptitude Test [SAT], American College Test [ACT] scores). See figure 4-7, section 3. 4. Training courses (courses qualifying the member to operate or maintain specific types of equipment). See figure 4-7, section 4. 5. Navy service schools/military training courses. See figure 4-8, section 5. 6. Correspondence courses required for advancement. See figure 4-8, section 6. 7. Navy Enlisted Classification (NEC) codes. See figure 4-9, section 7. 8. Personnel advancement requirements. See figure 4-9, section 8. 9. Rate advancements. See figure 4-9, section 9. 10. Designators (special warfare, etc.). See figure 4-9, section 10. 11. Awards (personal military decorations and unit awards). See figure 4-10, section 11. 12. Personnel Qualification Standards (PQS). See figure 4-11, section 12. 4-8 Figure 4-6. 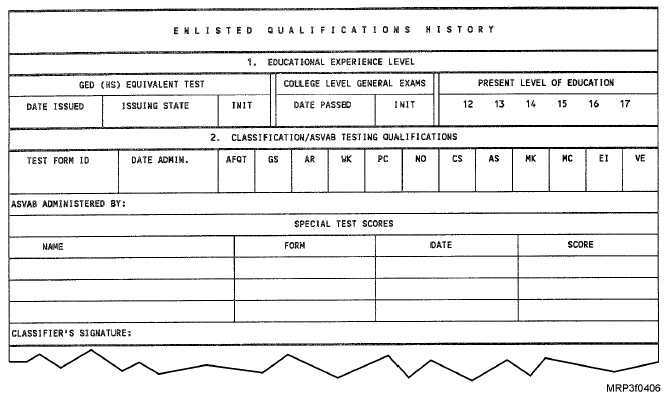 Enlisted Qualifications History (page 4), NAVPERS 1070/604, Sections 1 and 2.